Review by Liam Taylor. 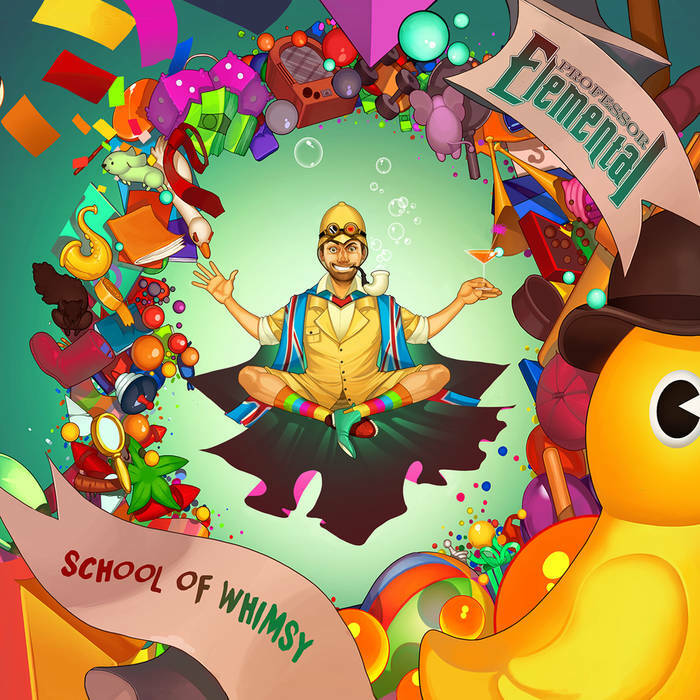 This month sees the release of School Of Whimsy from Chap-Hop MC extrordinaire, Professor Elemental. Along with guests, frequent collaborators and Mighty Boosh-esque comedy skits, the Professor guides new students through the finer points of being whimsical. In the opening rap of the opening track, Words from the Headmaster, what strikes me the most is the Professor's flow. He's never been a slow or unskilled rapper, by any means, but the skill with which these vocals are performed makes an impact very early on. A short track, but impressive nonetheless. Downside Up is a summer romp in which Ella Jeans's vocals put me in mind of Lily Allen / early Sia -style pop. Especially in the vocal harmonies, skanky guitars and horn section, all of which contribute to the summer vibe. The Professor is great at creating lyrics that make you think for a moment: "like Clark in a crisis, time to go change" (really now, I can't spell it out for you). Now we're on to my favourite track from School of Whimsy - One Too Many. The combination of humorous concept, catchy chorus and deft vocal performance make this track for me. Lyrically the track is about the trials of being on tour, the logical solution is to clone oneself. In a whimsical twist, the Professor ends up dueting himself. The pacing of the chorus is particularly fun - it feels like it's on the cusp of going too fast, but that's most likely intentional to suit the mood of the track. Track 7 is essentially the British, more accurate version of Macklemore's hit - especially given The Spoken Herd's similarity to Macklemore's vocal style. Jumble Sale features a jaunty piano loop, horns, organ and lyrics that imply this lyricist has actually attended a jumle sale, (or been in a Thrift Shop), at some point. Our guest rapper's flow is particularly impressive and entertaining. It's become a fad in recent times to embrace your anxieties, or at least to publicly declare them, (or maybe that's just my snowflakie echochamber?) It can get a bit gross after a while, but the subject is elequently handled in track 8, Nervous. A swinging romp through the Professor's apprehensions, which could be a nascent theme on this album. Make Good Art pt2, (the follow-up to a track on the most recent Menagerie album, which we also reviewed), is similar in tone and rhythm to it's predecessor, but is more of the timid, younger brother. Timid isn't a bad thing, it's still "Good Art". SQRL is a down-tempo whodunnit, (well, it would be if the title wasn't a massive clue), where the Professor awakens to find one of his shoes missing and his cuppa spoilt. Storytelling is one of Professor Elemental's strengths and this is a track in which he's able to create an immersive and engaging world in only a few minutes. Tom's House is a sweet track, ostensibly dedicaed to Tom Caruana. Sabira Jade's simple but catchy chorus elegantly compliments Elemental's descriptive rap and the summer reggae vibe of the track. Track 16, (and the final vocal track of the album), Good Morning is another example of Professor Elemental's rapping ability and punneriffic lyrics are certainly enough to get me out of bed in the.... well, maybe not the morning. Equally skillful is frequent collaborator, turntablist Nick Maxwell, who lends his aid to close the track - no baby scratching here though, these skills demonstrate precisely why Maxwell is on the Professor's roster. Good Morning got it's own video as well, embedded below for your viewing pleasure. Sunskip, is an instrumental number by Tom Caruana featuring sampled vocals that get inside your head despite being hard to decipher, along with a driving rhythm, subtle but acid-like synths and charming flute, (or clarinet? ), loop. Overall, School of Whimsy is a fun, witty and unique album, which you can stick on repeat and still find engaging. Trust me, I have tried. The timing of the release is impecable, being as this is the first sunshine I've seen in months and the album perfectly matches my current mood. This will be my 2018 summer album, I'm sure it'll be yours too.